As long as your hardware has an IR receiver, the Pronto can probably control it. Update, 5/4/2016: As commenter Inderjeet Singh has pointed out, the Android version of the Peel app is now available from the Google Play store. The number of mission-specific remote controls we’re forced to contend with in our lives grows every time we buy a new piece of A/V equipment. Have a cable box, a TV, a Blu-ray player, and a Hi-Fi? That’s four remotes to lose in your couch cushions. Installing device-specific apps on your phone or tablet is no panacea, either. Controlling your TV with one app, your cable box with another, and your stereo with a third? Please. To control this ever-growing tech tsunami, you have three options: You can spend your life searching your home for lost remotes and pray that the ones you find are the ones that you currently need. You can buy one of those expensive universal remotes—like the Ray Super Remote or the Logitech Harmony Elite—or you can pick up a less-expensive device that works in concert with an app on your smartphone or tablet, taking advantage of the latter device’s processor power and touchscreen and sending commands to your entertainment center via an infrared blaster. That’s what the Pronto Peel universal remote does ($50, available at Amazon.com). The Pronto, and its companion app the Peel Smart Remote, will turn your iPhone, iPad, or Apple Watch into a universal remote control. Yep, this is an iOS-only solution, but Android fans with smartphones that built-in IR blasters can download the Android version of the Peel Smart Remote from the Google Play Store for free. 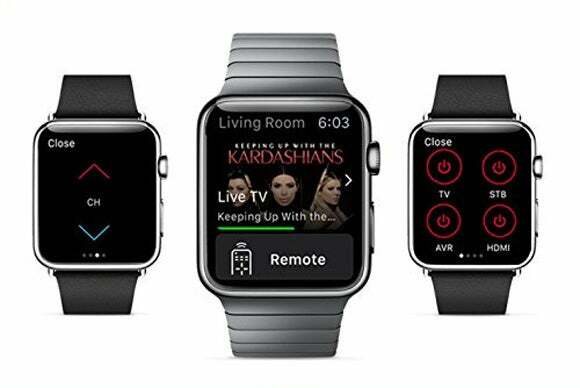 Installing the Pronto Peel app on your iOS device gives you the option of controlling your home theater with your Apple Watch. When you enter a command in the app, your iPhone, iPad, or Apple Watch fires off the order via Bluetooth to the Pronto which, in turn, translates the Bluetooth command into a blast of infrared light that travels to whichever piece of A/V hardware you’re trying to bend to your will. It’s an inexpensive, easy to set up system that works reasonably well—or at the very least, is less of a pain than trying to wrangle the four or five separate remotes that currently needed to run your home-theater system. The Pronto runs off of four AA batteries, which provide about a year’s worth of service before they’ll need to be replaced. That Pronto doesn’t need any wires in order to work its voodoo also makes possible to set it up most anywhere and the 360 degree IR blaster built into the top of the hub will make sure that so long as your electronics’ IR receivers are unobstructed and within the Pronto’s 30-foot range, there won’t be an issue with them receiving commands. Have hardware tucked inside a cabinet? The Pronto has that covered, too: it comes with an IR emitter on a 10-foot cable that can be threaded through the door. Here’s another review you might be interested in reading: Blumoo universal remote control. Setting up the Pronto to work with my cable box, television, and Apple TV took less than 10 minutes. I downloaded the Peel app to my iPhone, provided my location and cable-company information (so that it can deliver a customized schedule for the channels I subscribe to), and selected which pieces of hardware I wanted to control. That’s it. 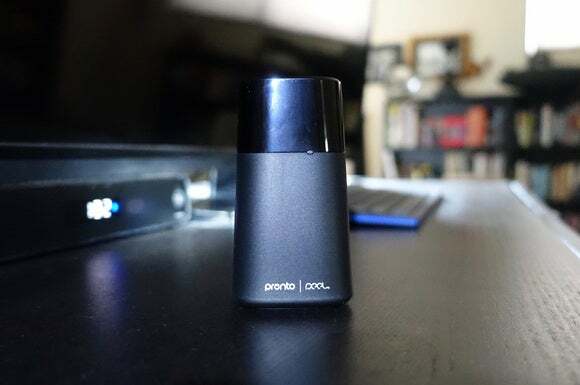 The Pronto provides support for Apple TV and Roku streaming boxes as well as a seemingly endless list of DVD and Blu-ray players, televisions, HDMI switchers, home-theater speakers and sound bars, and A/V receivers. And as an added bonus, it’s even possible to set up the Peel app to work with additional hubs in other rooms inside your home. Not bad for 50 bucks. The Peel app makes setting up your Pronto hub a breeze. 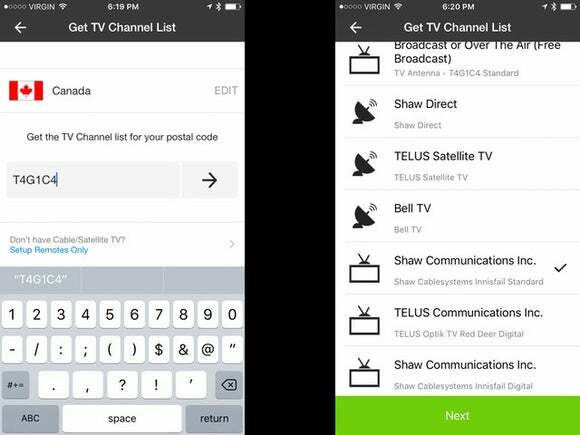 For starters, while the Peel app was able to download the channel guide for my cable provider, it doesn’t take service tiers into account. This means that you’ll have content from channels you don’t pay for packed in with the rest of the stuff in your program guide. Cord-cutters who rely on an over-the-air antenna are even more out of luck. This can make finding something to watch a huge pain. You can pair the Pronto with only one iPhone, iPod, or iPad at a time, so you won’t be able to substitute one device for the other (although you can use an Apple Watch instead). There is also no iPad-specific version of the app, the UI just scales up when you run the iPhone app on an iPad. And while the list of devices that the Pronto can control is impressive, it supports the Xbox One only as a Blu-ray player (not a Netflix streamer), and it doesn’t support the PlayStation 4 at all. You can’t control an Amazon Fire TV either, as that streamer relies on Wi-Fi Direct, not infrared. Finally, while the Peel app’s user interface for each device is functional, it’s far from attractive and you can’t customize the look beyond changing the function of a few on-screen soft buttons. The Pronto Peel is one of the least-expensive universal remotes you’ll find, but keep in mind that it leans heavily on your iOS device to function. Peel should also produce a version of the app that takes better advantage of the larger screen sizes that the iPad allows. The Pronto Peel is an inexpensive and easy way to control your home theater, but being limited to infrared means it can’t control devices that rely on Bluetooth or Wi-Fi for command and control.